A cookbook of easy-to-follow recipes, low-fat and sugar-free, using natural ingredients. Traditional Jewish dishes are also included. The healthy and delicious recipes are accompanied by dazzlingly beautiful graphics of original artworks, captioned with quotes from the mystical teachings of Rebbe Nachman of Breslov. Cover art and illustrations by the author (26 color plates plus b/w illustrations). The recipes are from the author and other contributors. 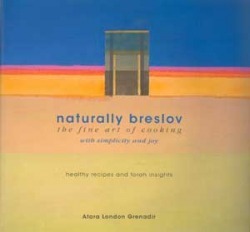 Oklahoma-born Atara Grenadir is a fine artist and painter, using oils and acrylics, who has exhibited her works throughout the U.S. She learned valuable cooking techniques at the New York Macrobiotic Center and the Gourmet Cooking School. Her search for new art forms and personal expression led her to explore the teachings of Rebbe Nachman of Breslov. The belief that “less is more” that had permeated her paintings and her diet now found its counterpart in the spiritual realm -- living with simplicity and joy. Available at fine Judaica bookstores in the NY area, including Eichler's, and at online Judaica sites.